Posh star Marcus Maddison takes on Gillingham's Brennan Dickenson. Photo: Joe Dent/theposh.com. 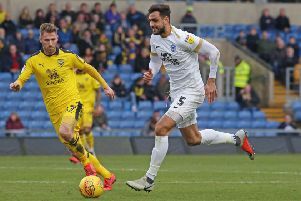 Peterborough United delivered a much-improved performance as they drew 1-1 with unbeaten League One side Gillingham at the ABAX Stadium today (August 29). Marcus Maddison was Alan Swann’s man-of-the-match. Souleymane Coulibaly: (for Washington, 64 mins). Tobi Adebayo-Rowling: (for Collison, 80 mins).